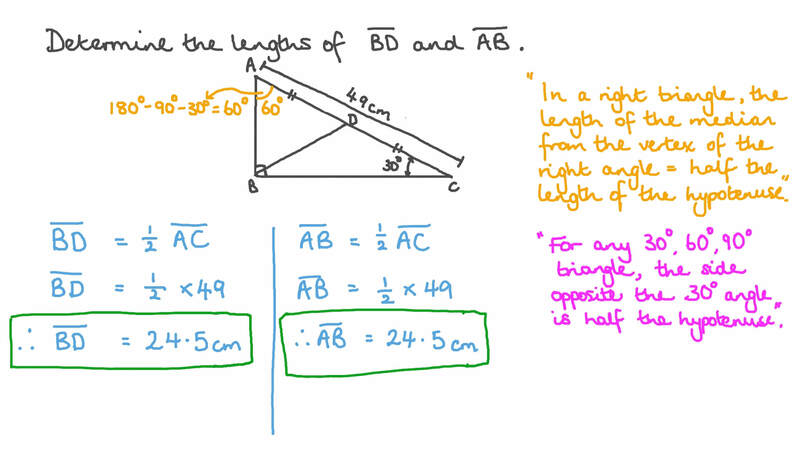 In this lesson, we will learn how to identify and use medians and altitudes of triangles. In △ 𝑋 𝑌 𝑍 , where 𝐴 is the midpoint of 𝑋 𝑌 , what name is given to 𝐴 𝑍 ? In a triangle 𝐴 𝐵 𝐶 , 𝑀 is the point of concurrency of its medians. If 𝐴 𝐷 is a median, then 𝐴 𝑀 = 𝑀 𝐷 . What is length 𝑀 𝐵 rounded to the nearest hundredth? Find the length 𝐴 𝑀 , given that 𝐴 𝐸 = 5 4 . Determine the lengths of 𝐵 𝐷 and 𝐴 𝐵 . In △ 𝐽 𝐾 𝐿 , 𝑅 𝑃 = 2 . 1 c m . Find the length of 𝑃 𝐿 . In △ 𝐾 𝑀 𝐻 , 𝐾 𝑄 = 2 and 𝑄 𝑃 = ( 5 𝑥 − 7 ) . Find 𝑥 . In the given figure, segments 𝐴 𝐷 and 𝐶 𝐸 are the medians of △ 𝐴 𝐶 𝐵 , where 𝐴 𝐷 ⟂ 𝐶 𝐸 , 𝐴 𝐵 = 1 7 . 7 c m , and 𝐶 𝐸 = 9 c m . Determine 𝐶 𝐴 to the nearest tenth. In △ 𝐽 𝐾 𝐿 , 𝐽 𝑃 = 6 c m . Find the length of 𝑃 𝑆 . Given that the area of △ 𝐴 𝐸 𝐶 = 2 5 5 c m  , find the area of △ 𝐴 𝐵 𝐶 . Find the length of 𝐵 𝐷 and the perimeter of △ 𝐴 𝐵 𝐷 .
Equilateral triangle 𝐴 𝐵 𝐶 has side 50.6. Given that 𝑀 is the intersection of its medians, determine  𝑀 𝐵 ⋅  𝐶 𝑀 . Given that 𝑃 𝐾 is a median of △ 𝐽 𝐿 𝑃 , 𝐽 𝐾 = 3 𝑦 − 8 , and 𝐿 𝐾 = 2 𝑦 − 4 , find the length of 𝐿 𝐾 . Use the data in the figure to determine the length of 𝐷 𝐹 and then the perimeter of △ 𝐷 𝐸 𝐹 . In triangle 𝐴 𝐵 𝐶 , 𝐴 𝐵 = 𝐴 𝐶 = 1 0 c m , 𝐵 𝐶 = 1 2 c m and 𝐷 is the midpoint of 𝐵 𝐶 . Find the length of 𝐴 𝐷 . In triangle 𝐴 𝐵 𝐶 , 𝐴 𝐵 = 𝐴 𝐶 = 1 0 c m , 𝐵 𝐶 = 1 6 c m and 𝐷 is the midpoint of 𝐵 𝐶 . Find the length of 𝐴 𝐷 . Given that 𝐴 𝐷 = 9 c m and 𝐸 𝐵 = 𝐴 𝐵 , find the perimeter of △ 𝑀 𝐷 𝐸 . Given that 𝐴 𝐵 = 𝐴 𝐶 = 2 2 c m , 𝐶 𝐵 = 2 0 c m , and 𝐸 𝐵 = 𝐸 𝐶 , find the length of 𝐴 𝐷 . What is the length of 𝐶 𝐷 ? Given that point 𝐸 bisects 𝐵 𝐶 , point 𝐷 bisects 𝐴 𝐵 , 𝐴 𝐸 and 𝐶 𝐷 intersect at point 𝑀 , and 𝐴 𝐸 = 3 3 c m , find the length of 𝑀 𝐸 . Given that 𝑀 is the point of intersection of the medians, 𝐴 𝐷 = 4 . 3 6 c m , 𝐵 𝑀 = 3 . 4 7 c m , and 𝑀 𝐹 = 1 . 5 9 c m , find the lengths of 𝐴 𝑀 , 𝑀 𝐸 , and 𝐶 𝐹 to the nearest hundredth. In the figure, calculate the length of 𝐴 𝐷 . Given that 𝐸 𝑀 = 1 4 3 c m and 𝐴 𝑀 = 2 𝑀 𝐷 , find the length of 𝐷 𝐹 . Given that 𝐸 𝐷 = 7 . 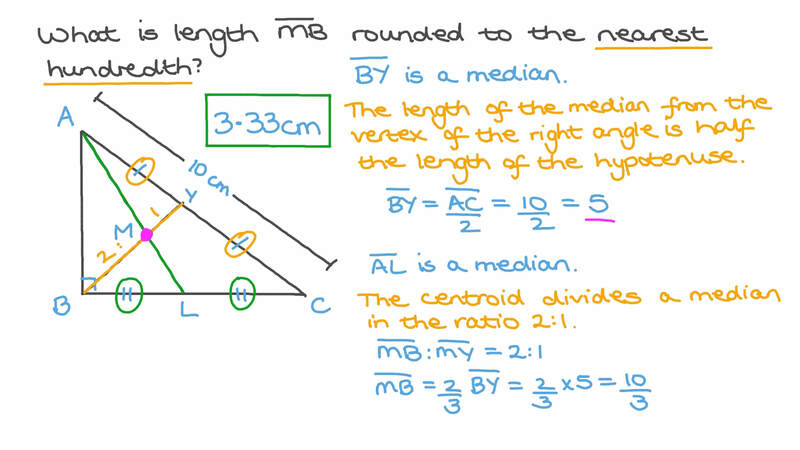 5 c m , find the lengths of 𝐴 𝐶 and 𝐵 𝐸 . Given that 𝐴 𝐵 𝐶 𝐷 is a parallelogram, which line segment is a median in △ 𝐴 𝐵 𝐷 ?